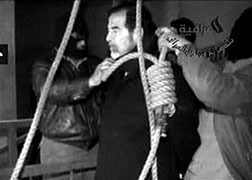 The execution of former Iraqi strongman Saddam Hussain has triggered an avalanche of views and commentary from around the world on the fairness and correctness of what passed off as the judicial procedure which ended his life. A sexually abused Canadian child has been placed under protection after sending an appeal for help over the Internet to an Australian website, Canadian police said on Friday. China on Saturday ordered its foreign ministry and its embassy in Nigeria to "give all their efforts" to free five Chinese telecommunications workers taken hostage a day earlier in the African nation.